Camp S-122 -.Co. 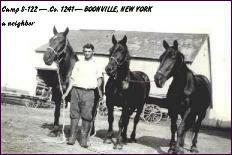 1241- BOONVILLE, NEW YORK. Carolyn Kaczka, co-chair of the Azure Mountain Friends. Before I get to my story, I would like to give you some background about my family’s activities, which led me to make some changes to my life. Previous to the great depression of 1929 the Harrisville paper mill had closed in 1927. My Dad was kept on as a boiler-tender and watchman for a time after the mill closed, and occasionally I would be at the mill making the rounds with him as he checked out the other floors. The mill had to be heated for insurance reasons and for the security of the property. Then the ‘29 Depression hit the country with a devastating blow and he was laid off too. Dad was forced to sell our house on Pearl Street. We then moved up on Maple Street across from the Methodist Church, to a building that had three floors. The first floor had a lunch counter and ice-cream bar. We lived on the second and played on the third. Dad opened up the lunch counter and served lunches and ice cream to the public. He had developed a bad case of ulcers some time prior to moving but he was still cooking food for the customers. In the spring of 1931 we moved to Gouverneur. It seems that I had to be doing something all the time in order to be contented. Therefore, working at odd jobs to help the family with the food was no big deal for me. I did work, like delivering fliers (hand bills) on a Saturday for the Grand Union. I delivered to half of the village one week, then the other half the next week (Population about four thousand). I received fifty cents each time I delivered the handbills. This job of delivering handbills lasted for a couple of months and soon it got boring; so then I looked for greener pastures. I even worked in the Grand Union store stuffing paper bags with potatoes, a peck in each bag, or cleaning out the back of the store. Stocking shelves was what I liked best for I would be out front in contact with the shoppers; the pay for this was two dollars a week. I also had a paper route for a short time and I still remember those trips up and down the streets talking to the people on their verandas and of hearing the sound of the nightly programs on their radios. Another job, which I got off to a good start with, was delivering flowers. It all started like this; As I was walking down the main street past a flower shop, the store owner asked me, "Do you want a job? "; I said yes. So then he gave me ten cents to deliver a bunch of flowers just a short distance down the street. I thought this was a good deal, but the next day I got another delivery to make. It was way out on the other side of the river in the country for a “wake” at a private home. Incidentally, the vigil I delivered flowers to was the home of a little boy that had drowned in the river by the bridge along the main street. I had seen the boy being pulled out and saw the people working on him to bring him back, but it was too late. That was the last delivery of flowers I made. My story starts when I quit school in the spring of 1937, I didn’t finish the year and I ended up going to Gouverneur to work as a cook in an all night restaurant. I soon tired of this. So in September I came back to stay with my Dad in Harrisville. At least with my dad I had a bed and meals, of course if I had not been so pigheaded in my earlier days where my dad was concerned I might have had a better relationship with him and not left in the first place. In September of 1937 I went back to school. I tried to buckle down and study, but the wanderlust had got to me. In the last part of October while sitting in school I felt that I had to do something, therefore at noon I went outside just to clear my head. While thinking things over I spotted one of my grandfathers trucks coming up the hill loaded with logs and headed out for Lowville. I knew then what I wanted to do, so I ran out and hailed the driver for a ride. I rode along with him talking about what I should do and he agreed that what I planned was probably the best for me. Soon we got into Lowville and I had the driver let me off in front of the county building. I then went in to see about the ‘Civilian Conservation Corp.’ where I signed an application to join. The truck driver picked me up on his way back and I rode home telling him to say nothing to anybody about my trip. I was very much aware of what the C’s were all about for the ccc boys had been coming to town on weekends since the insertion of the camp over on the road to Croghan, about five miles from us. Moreover, one of the boys from camp was courting my sister Myrtle. School was now only a stopgap for me while I was waiting for news about the Civilian Conservation Corp. I continued school through the fall and even studied a little harder as now I had some direction in mind. Now the school had cleared out a field over in the back of the big rocks for a ball diamond and we used this field to hold some of our other school activities. This one fall weekend the Junior High School class was in the field trying to raise money for a trip, I don’t know where they were going but I stepped in and helped them all I could. They had a regular carnival set up, with booths for selling cookies, some games like ring tossing, etc. and a hotdog stand. I worked all day long, doing my thing of hawking the sale of the hotdogs and soda for them. With my past acquaintance of working the fairs it was very easy to start calling out to the people “get up here and get your hotdog,” etc. before the day was over I was so hoarse that I could hardly talk. I was always doing something that the consequence got me into bad trouble. One I remember very well, It all started out at a dance at the school on a Saturday night. I had teamed up with this boy and we went to a local grocery store, that wasn’t open, after the dance. Well, we took what we wanted; Small change some candy, and then climbed back out the side window we had used to get into the building in the first place. This all happened about 1 o’clock in the morning, I think my sister Myrtle heard me sneaking into the house, for later she told me that she knew that I was in on this deal. Well anyway at school on Monday the state police came and picked up the other boy. They knew he was one of the guilty participants but he said that he did it alone and had broken into the place at ten o’clock. As I was at the school dance till midnight I was never connected to this affair. I was really lucky, for this boy could have blabbed but he didn’t. --- This is one more affair that brought me to my senses and helped get me on the right path of reality. Another time this same boy and I got into Kilbourn’s planing mill down on the river road, we poked around for a while but when we left we didn’t take anything of value. I had no guidance back then or anyone to help me in my planning for the future, no one to talk to about what I should do, just the truck driver who was merely a friend of the family. I suppose that this all came about because I always had been so set in my ways and now I would have to pay for it the hard way. I don’t know what I would have done without baseball, basketball and the band, all this helped to kept me from going nuts I was becoming more and more restless as time went on. I still helped Gram with her garden from time to time . Saying this brings back memories of when I used to help her and how she would bring out some lemonade and freshly made cookies for me to eat. I wish now, I could express what my feelings were back then for my her. See, we were very close and I never went by her house without stopping in to see her. I just enjoyed doing things for her and my grandfather. In fact all of my sisters felt the same way. It is good that children had grandparents to fall back on like we did. I guess I have said this before but she was our second mother while we were growing up. While I was waiting for some news, I kept thinking about all the good times I had, had up till then and now maybe I didn’t want to leave home but it was inevitable that it was going to happen. A Surprise; It was a little before the Christmas holidays of 1937, that Dad and I had gone to my grandparent’s house for supper. While everyone was seated, my Grandmother brought out this letter that had come in the mail at her house addressed to me. The letter was to inform me that I had been accepted into the Civilian Conservation Corps. And I was to report on January 19, 1938. While I was reading it to myself, Dad asked me what the letter was about. I hadn’t told him that I had been to Lowville earlier in the fall to sign up for the CCC’S. Well, when I showed it to him he just said, “You might just as well go, for you won’t amount to much around here anyway.” I remembered this for a long time as it truly hurt me. He did take me to Lowville on the appointed day since I needed him to sign the necessary papers for my enlistment. In the filling out the part about my monthly pay of thirty dollars a month, I signed over to my dad twenty five dollars of it to help him and my sisters with the bills at home. After the necessary paper work was all signed and we had said our good byes, I observed by his expression that maybe he did care about me after all. Our way of life was strictly controlled. 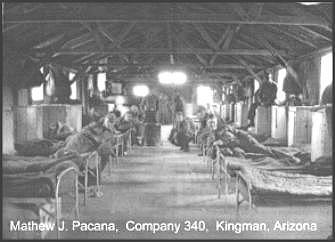 There was a daily routine, including everything from working and leisure hours, bathing, barracks had to be kept cleaned, beds had to be made before breakfast with no wrinkles in the covers, cleaning of the camp site and more. The CCC's were a result of the economic and social turmoil of the Great Depression. In one swoop the government undertook not only to employ hundreds of thousands of young men but also to house, cloth, feed and discipline them as well, all while creating for society a force for environmental conservation, construction and recreation. It was a monumental undertaking in a time of such economic hardship. It is unlikely that such a program, so costly and so idealistic in its goals, its premise and its tasks, could ever be fully enacted today, nor at any time before. As such, it is an entity which cannot be fully understood without understanding not only exactly what it was, but what circumstances bore it and how it was shaped as it came into being. The pages to be linked to below will, hopefully, enable that general background of the CCCs to be somewhat clearer to the visitor so that the contents of the other sections of the Museum will be more fully understood and appreciated. Perhaps more importantly, in this day of crumbling morals economic uncertainty, environmental deterioration and collapsing social welfare programs, a fuller understanding of the basis for the social, economic, environmental, and moral achievements of the CCCs may point the way to future successful endeavors. In all, 4,500 camps were built from the east coast to the Pacific and Alaska also had a few. The C,s was under the jurisdiction of the Army. It was not meant to be a military training camp but just a place for boys to be housed while working for the State on conservation projects. Some army personnel were quartered at the camp on a permanent assignment for the purpose of supervision of the boys. Camp #1241 had twelve buildings in all; some can be seen on the right in the above picture. (In the far distance, is a farmhouse, that’s where ‘short wave’ lived, ---more about her later.) Now the long building just past the parade grounds is the administration building where 1st Lieut. M.D. Dunlap in charge of the camp lived. The barracks were all in a row and starting with the one at the far end, this one housed the civilian supervisors, a blacksmith, a woodsman, chief auto mechanic and the personnel adviser with his office. Back this way is the number two barracks, which was for all personnel under the permanent control of the army. This included army truck drivers and people that worked in the administration building. The next five buildings this way were for the regular enlisted boys with an army Sargent in each barracks to keep things under control. Next in line was a building of fourteen stalls for the trucks. 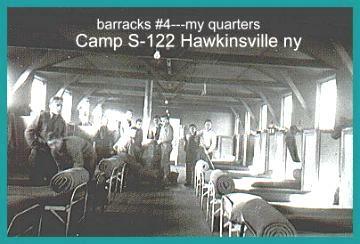 The camp kitchen and mess hall were in the center of the complex. 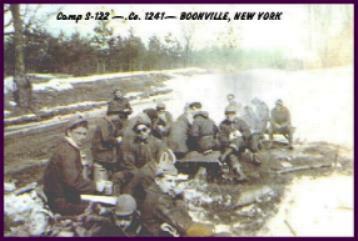 Food was prepared and served by our own CCC boys, it taught them skills they would use nearly every day in the future. Now over behind the barracks was the latrine with toilets, showers and a couple of washing machines for doing our laundry Yes, we had toilets; at least we had the seats, about eight to a side in a row, on a long wooden box with running water in the bottom to flush it out. This was nothing fantastic but it was usable. Trucks all in a row waiting for an inspection, first in line is a Chevrolet pickup for the use of the mechanic. Next in the line, are two Reo dump trucks and seven Chevrolet stake rack trucks for transporting the boys to the work areas, also a Caterpillar tractor model.#4. (below) These units belonged to the state. On the far end are two army trucks that were used to transport the boys on weekend trips to town. Picture from another camp, this shows the way the trucks were covered with a canvas to keep the men dry. If it was a bright sunny day the front of the canvas would be opened for ventilation. Friends, I had many but they’re long forgotten. Its too bad people can’t keep in touch with each other later on in life. 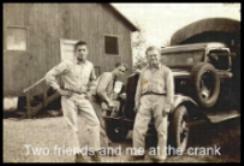 In the background of the left hand picture above is the garage for repairing the trucks and Carl A. Voil was the Forman. One end of this building was used as canteen where we could buy some snacks, soft drinks or just lounge around. Our Countries economy was helped immensely not only by putting young men to work but with the purchasing of trucks, tractors, lumber, and all the other goods that was needed to supply 4,500 camps through out the Nation. The maintenance of all trucks and equipment was of high priority at the camp. The oil was changed on a regular time schedule and lubrication was done about every week if the vehicle was used very much. In the fall the truck radiators had to be flushed and antifreeze added with enough to protect down to 50 below zero as per the instructions we had in our manual. The trucks and other equipment were usually washed on Saturdays; it was a constant struggle in keeping the trucks clean and in tip- top condition. We never knew when we would have a surprise inspection from the state or from the army inspectors. Fire drills were held rather often, from the time the fire alarm sounded we had a time limit of six minutes to get them all out of their stalls. It was the duty of the first person responding to open all doors, the next person would go from truck to truck kicking out the blocks from the front wheel letting them roll out onto the parade ground away from the building. The truck brakes were never set also they were not left in gear when parking, even though the floor was made on a slight incline, we just blocked one front wheel to hold the truck in place. Each barracks had three potbelly stoves to keep the forty boys warm and comfortable through the long, cold winter months. We had a fire-tender who came through the buildings and stoked the fire with coal at midnight and again about 4 am. Coal was used for heating so a number of the windows had to be open until the gas was burned off. It got pretty cold but we always had plenty of covers. I was lucky for my cot was right in line with the center stove. Take notice that in the picture all cots were set for the boys to sleep alternating head to two, also notice that we all had lockers to store our clothes in. James F. Prime, 1st Lieutenant Ret. was replaced by M.D. Dunlap 1st Lieut. Our day started with the sound of a bugle from the p/a system, blasting out reveilles at 6:00am, we had just enough time to get dressed, then hurry to the mess hall for our breakfast and be at the parade ground ready for role call by seven-o’clock. 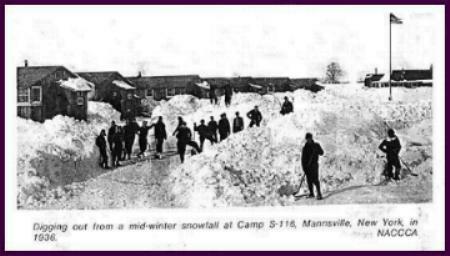 At this time we would be turned over to the state and they would assign us to work crews for the day but if the temperature was lower than twenty below zero we did not have to go out to work, we could now lounge around, or maybe catch up on our laundry work and do whatever we wished. On the nights that the movie house in Boonville was open we might go to town and see a show. The first few weeks that I was in the CCC’s was a very lonesome time for me. Homesick? Yes, I suppose I was, but after a few weeks of working and making a few new friends I soon became adjusted to being away from home. I do recollect that I had taken a can of simonize with the intention of giving it to my Grandfather, but it was found out and I was ordered to report to the camp consoler, I was told in no uncertain terms that this was not sanctioned and that I could be kicked out of the Cs if I did anything like this again. Trucks were nothing new to me for I was involved with my Grandfathers trucks since I was twelve years old, changing the racks to log bunks and vise versa. Some times the bolts holding the racks would be to hard for me to turn so then Gramps would loosen them and then leave me to finish switching the racks alone. Also I would deliver fire wood around the Village to customers when Gramps was busy with something else. Working around the garage I could move the trucks in and out of the garage, that is all, for I didn’t have a license yet, but an army permit was issued to me so I could drive the Army vehicles. 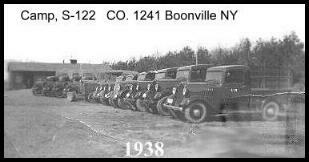 Later in the spring the camp personnel officer took me to Lowville where I took a road test for my state license, it was not long after this, that I was transferred to driving a State vehicle to transport a crew to job sites. A significant advantage now was that I did not have to report for roll calls any more for it was my duty to have my truck ready to take a crew to the work site. The eighteen boys in the crew rode in the back of the truck, which had a canvass top. ---Incidentally, trucks did not have heaters back then. Earlier when I had been at the mess hall for breakfast, I had picked up some coffee, sugar and a bag lunch for each boy that rode in my truck. When we got to the work site and the boys were all out working in the woods dragging brush I would start a fire so the boys could get warm and dry off. At noon time they all came to sit around the fire for lunch and my coffee that I made over this fire using two water pails. When the coffee was hot and steamy I always cracked an egg and dropped one in each pail, this way the coffee grounds got cooked with the egg making a cleaner brew. O yes, I had acquired the eggs at the mess hall when I picked up the lunches. If I got cold while waiting for lunchtime I would pitch in and help the boys drag out some of the brush. Dragging brush was not a bad chore because when we were passing each other on the return trip someone was sure to start wrestling with a buddy. We did have some liberty in working, just as long as we showed up out at the burning pile now and then. Some time in later part of March my duties were changed and I had to go up to the side camp at a place called Highmarket on Tug-Hill. This temporary camp was built so as to be closer to the work area; it was about fifteen miles away from our main camp. 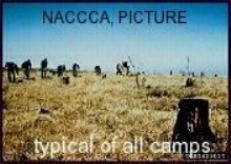 The living quarters for the boys consisted of three tents for sleeping and one for our meals. The tents had wooden floors and a small stove so it was not awfully cold sleeping, even when the temperature got below zero. A small sketch as per my memory. On one of the trips to the side camp I had a horse run in front of my truck, I hit the brakes making no contact with this horse. But he went running off into the pasture hitting a fence. I continued my trip thinking no more about this episode, now it seams the horse died of fright or old age and the farmer reported to the camp that I had hit and killed his horse. After a couple weeks I was called on the carpet by my supervisor, for not reporting this incident, to me this was no accident, as I did not hit the horse. After a meeting with my supervisor and the farmer, he acknowledged the story I presented was true. I recall another trip I took with a load of timbers up to the boys to use in the construction of some cribbing they were building along a creek. It was late in the day when we had all the timbers unloaded, so the other truck moved out in a hurry, taking all the other boys. It had been raining most of the day and the field I had to drive across had thawed considerably thus letting the truck break through the rutted road. By the time I got to the end of the road I found that I was not able to get out of the ruts up onto hard ground. I backed up the truck a few yards for a good running start, but no use I just could not get enough momentum to get out. After spending an hour or so of this, my next move was to walk about three miles in the rain to a farmhouse that had a phone. I called the main camp for them to send out the bulldozer to pull me out. As the duty man did not want to send out the dozer so late at night it took some explaining on my part to convince him that if the truck was left over night it would be froze in solid by morning. Well, it was 11:30 before I got back to camp that night soaking wet and half froze. A little later in the spring I was trucking some logs back to camp, and as I started down the hill into Hawkinsville the load shifted and a chain broke wrapping itself around the axel of the truck thereby breaking the brake line. Down at the bottom of the hill was a sharp left-hand turn, no way was I going to make it but I must have said some awfully good prayers for the next thing that occurred was for one of the chains tangled with the other wheel thereby locking it tight and this brought me to a standstill. It was amazing that young boys could do the things that they were called on to do. Think of this for a minute, when we had to haul gravel for stream erosion we would back our trucks up to a gravel bank to get it loaded. We did not have any bucket loaders or any power shovels, just eight or nine strong backed boys with shovels. They would get the truck loaded in about twenty-five minutes. At first, being new on this kind of a truck I had a devil of a time getting out of the pit. I had to depend on our crew leader for the first few loads to drive up the bank and then I took over from there. We had 1937 Reo speed wagons for dump trucks, and the shift pattern was crazy and it took awhile for me to get used to shifting on a hill. This was my first introduction to double clutching. She was just a farmer’s daughter and all of us boys waved to her when we saw her on the road going to or coming home from school. She would wave back with only her hand moving and not her arm, so someone nicknamed her short wave. Seeing as how she lived right next to the camp and two hundred boys, this necessitated a lot of shielding from us, by her family. Somewhere around Easter time I found out what her name was. ( but now forgotten.) See her parents had extended an invitation for three boys from the camp to come over to their house for a Sunday dinner. Two others boys and I were picked by our ‘personnel advisor’ but one of the boys that were picked did not want to go. He had a very bad choice of words when talking and he admitted it, finally after some coaxing he consented and said he would just keep his mouth shut. Every thing was fine until we sat down for dinner, then the farmer’s wife said “Fred, how come you don’t have much to say, you are awfully quiet.” Well he spoke up and said that he was aware that he used very bad language and he did not want to (screw) up. Only this is not the word he used. We all held our heads in shame as we finished our meal. During that summer I spent quite a lot of time helping the family with their milking and with other chores. Another embarrassing episode happened at the theater In Boonville where a couple of boys and I were watching the show and we got a whiff of a horrible odor. Couldn’t figure it out either, but after the show when we were all standing around outside talking, another boy from the camp come out of the building and joined us. We knew then what the smell was. --- I was not in on the G.I. bath, that was given to this guy but I know that from then on he took a bath at least once a week (A GI bath is when a bunch of boys give a scrub down to a boy that is to lazy to take a shower regularly). Weekends were a boring time at camp for the ones that got stuck with no place to go but one thing in our favor was we could go dancing. Understand, we were in farming country and it was predominantly ‘Polish, they were great people and they worked hard and played hard and dancing was a big thing for them, they had picnic groves set up all around the area and one thing they all had was a plank-floor for dancing. We, that is, the CCC boys were always there having fun at these affairs but we soon learned, don’t mess with the girls when off the dance floor or you could get into big trouble. Harrisville was still home to me and this is where I ended up on weekends and holidays. I always stopped in to see grandma and grandpa whenever I was in town. A couple of times they took me back to camp, I remember that on one trip I borrowed five dollars from Gramps and I never paid him back, but I don’t believe he expected it back anyway. Of course all the other times I had to hitchhike but this was no problem, for I was very lucky about getting a ride. People traveling back then were very good about picking up boys in uniform. Although I do remember the time that I was near the school thumbing a ride back to camp, and this car went by very slow and then it stopped in front of the new schoolhouse. Sensing that they had stopped for me I ran up to the car and climbed into the back seat thinking what a lucky day, then what a surprise I got when the women and her husband informed me they had only stopped to take some pictures of the new school. Talk about an awkward situation. This was one for me. On each visit home I felt more uncomfortable for I was getting met with less enthusiasm from my sisters and my dad, likewise at Lapars. I guess this is because we were all getting more mature and besides each had their own life ahead of them. Everyone was always glad to see me but they just had their own friends. I still went up to Lapars on when in town but my dance partners were getting less available. This led me to other forms of escape on the weekends from the camp, Like Volunteering to drive the baseball team to other camps for their games. 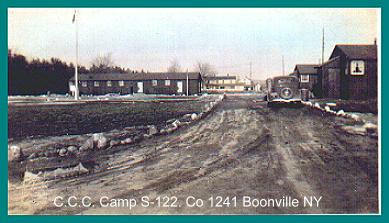 I recollect going to Mannsville camp S-116. but it was not this time of year as per picture. On one of my many trips home I had bought a new suit of clothes from the store of Mr. Garves. Course I had to show it to all my friends so I went up to LaPars’ for some dancing. Along about ten o’clock I realized how late it was and I still had to get back to camp. I did the usual thing of hitting the road and thumbing a ride. I was soon picked up by salesman but the ride that I was given terminated at the junction of the road going over to Rome NY. from Turin. My chances of getting a ride from here did not look good so I just started walking the rest of the way to camp in the pouring rain, a distance of about 15 miles. I arrived at camp at seven o’clock and I found that I was scheduled to go to the side camp up in Highmarket with a truckload of food, so now I put the suit in the washing machine and turned it on. I made arrangements with my buddy to put it in my locker when dry; I then went up to the side camp for the rest of the week just hopping that the suite would be in fair condition when I got back. How about this, some boys had gone into Boonville to see a show. Well anyway on the way back to camp they came by a cemetery and picked up a gravestone that was about two inch thick and flat. When they got to the barracks, they put it under the bed covers of another member, a little later the victim to be came in and just jumped on the cot and what a surprise he had. The cot collapsed and as everyone made believe they were asleep he had no one to help straighten it up again. Of course the barracks leader made the jokers return the stone the next day. Another joke that was played on other members was to fold the legs of a cot, just a little, and then a rope was tied to the legs in such a manner that with one good tug on the rope the bed would collapse, this was done after everybody was sound asleep. Initiations for all new recruits, we had them to. Fact is it happened to me on the second week I got to camp. No fun either. You see the CCC s was implemented to get the boys off the streets. But now what to do with them was the question. This is where the State came in and used this boy power to their advantage. Reforesting was very high on every body’s mind back then, so what better utilization could be found than cleaning out the dead brush, making fire breaks, planting trees, and also stream control. Working out in the woods dragging brush was hard work. (I can attest to that, remember I told you, one of the first jobs I had was dragging brush.) Being young and in good shape these boys could work hard all day and they were ready for anything when they got back to the barracks. The boys were never out of work for if not dragging brush in the winter they would be planting seedlings in the spring. I didn’t get involved in the actual work of planting, since at the time I was driving truck. But I did have to go to the tree nursery down to --- darn, I can’t remember where this was now. Well anyway it was my job to truck the seedlings that I had picked up to the various fields for planting. The CCC’s were responsible for planting millions of trees throughout our Nation in the late thirties. And this was a backbreaking job for the boys, for in the process of planting, one person went first with a pick ax and made a hole to receive the seedling, then a second person put one in the hole. Now as he moved forward for the next, he stepped in such away that the ground was firmly packed around the planted seedling. And then on to the next and so on, I don’t remember how many seedlings were planted in a day but I do know that it was in the hundreds. Hey I found the answer, over 3 billion trees by all the boys. 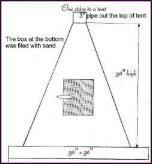 It was not always flat ground, look to the left.. Stream erosion was also a major concern for the state. So when called upon for their services the crews would go out and install log barriers along streams to keep the banks from eroding. This work was not limited to just state land; it could be done for farmers that had trouble with a creek overflowing their land. All they had to do was put in a request for work to be done on streams running across their property. The crew consisted of a state forester and a crew leader and of course about eight or ten boys to do the work. By the time the weekend came around the boys were ready to go back down to the main camp. If they didn’t have k/p or any other weekend duty, they could draw a pass and go home. Being a truck driver made me a gofer also. So when the cook or boys needed fresh water it was up to me to go and get some. Our fresh water for the side camp was picked up at a farm down the road and at various times I went alone. This filling of twenty or thirty milk cans, at a hand pump was quite a job for one boy, not only that but the cans had to be swung up onto the truck after they were full. When I had help, it was easy, but being alone was tough and it took awhile before I got the hang of swinging the cans up onto the truck. Now, Camp life in the winter was not so hot, (another pun), Really, we did have it easy up here at the side camp, as long as we took care of the things that required doing. 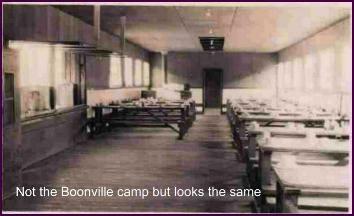 I frequently had to go to Lowville for fresh food, or other things that the main camp didn't have. I recall the time that I was coming back from one of these trips and I had stopped near a small creek so I could relax and eat my cold sandwich alongside the road. Being thirsty I went over to the creek for a drink, then I heard a roaring sound. The creek was not very big where I was; in fact I believe I could have jumped across it. But I went downstream for some distance to investigate it and came to a line of trees and brush that shielded the creek from my view. I worked my way through the brush to where I could see over the bank and I saw that the creek bed was about a hundred feet below me. I had walked around some falls and not realized they were there. This was the >Whetstone Gulf= and I was at the headwaters of the Whetstone creek. ---Years later in traveling along the roaad near the park I stopped and took my family up the gorge where we had a picnic and we spent the day site seeing just so I could prove to my wife that all my stories were not figments of my imagination. Some people were very skeptical of the boys in the camp and I believe they had some good reason to be. One instance comes to mind. We were not supposed to own a car but some boys were always conniving a deal with some dealer to try one out. This one weekend a boy went to Constableville, a small village further out from our side camp on Route #26. Well, he talked the local car dealer into letting him try out a car, after a few hours of joy riding he abandoned it near our side camp. Some of us did not want anything to happen to make people more distrustful of us so we decided to take it back ourselves, which we did. But over all, the boys were well liked, for you see many boys were from the North Country. 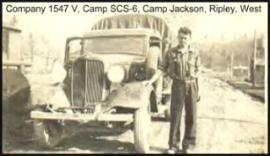 One Camp was near Harrisville out on the road to Croghan, and Jimmy Lathan was a member of this camp. He courted my sister Myrtle for a while and soon he became my brother in-law. Also, Kermitt VanBrocklin married Marilynn, another sister of mine. There were boys in our camp from all over our country even some from Puerto-Rico. It was a lot of fun trying to understand the ones from Puerto-Rico for they spoke Spanish. The ones from New York City were the best of all, for they spoke English with a different accent. This was no big deal we just had a lot of laughter now and then. My enlistment in the Corps was not very long but I did make a few friends, There was Donald Covey from Lyons Falls, and a friend named Tanner from Port Leyden, we all bunked in the same barracks so we usually made weekend plans together. Week-end passes were hard to get during a summer dry spell since we might get called up for fire duty to go fight a fire out in the woods. I always had to be available for driving a crew out to where ever the fire might be. I never did any fire fighting myself but I did take a crew to a fire up in the Schroon Lake section. Fire fighters back then did not have the equipment like now days, all they had were shovels and pick-axes to work with. Although they did have an Indian water tank on their back with a pump-gun for wetting down hot spots. To control fires a lot of work was put into building fire trails in the woods so that fire fighters could get to the fire much quicker and easier. These trails were also a very good firebreak for any fire that got started because of someone throwing a cigarette from a vehicle. You want to know why and how I left the CCC’s? Well, I had been writing back and forth to my mother who was living down in Hartford, Ct. I had just signed up for another term in the C’s and I had some leave time coming. 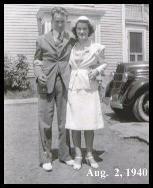 She had already sent me her address so in September of’ 38, I caught a ride with a driver of a vegetable truck. We got to Little Falls but the underpass was blocked therefore the driver had to turn around and drive up a steep hill where he had trouble with the truck for it kept stalling out. To top it off, the emergency brake did not hold very well, so I held the brake each time the truck stalled. Well, we finally got to Albany and he let me out at his destination, but it was short of mine. It was about three in the morning so I stopped for a sandwich and a coffee in an all-night White Tower restaurant. While getting warm and talking to other customers I met up with a salesman that was going right to Hartford. I was soon on the road again getting into the city at noon. Here I had some disappointments, the address I had for my mother was a vacant lot on Walnut Street. Here I am, a country boy in a big city don’t know anybody, so now what should do? Well I went to the train station and talked to the women at the Western Union counter for advice. After her hearing my troubles she sent off a telegram to my Grandmother back in Harrisville, asking her for the right address. What a disappointment it was when I got the answer back, it was for Springfield, Mass. Mom had given me an address but as the letter was postmarked Hartford I assumed the address was for Hartford. It was about four in the afternoon and it had started raining but I took off for Springfield anyway, (hitchhiking of course) When I got there, I found that it was the home of Frank and Eileen, some friends of my mother. While I was waiting for my mother to come up from Hartford, Eileen made me a Hamburg sandwich, the first I had to eat since I was in Albany the day before. The trip to Springfield was all for nothing for mom did live in Hartford. O’ the women at Western Union in Hartford only charged me fifty cents for the service. A good thing for that’s all I had left in my pocket. With a lot of rain and the 1938 hurricane hitting the east coast I become trapped in Hartford. I worked on flood control for a few days along the river, and then with no money in my pocket I thought it best for me to get a job, which I did, at a sheet metal shop. I liked the work so decided to get out of the C,s. As my two week pass was about over I called the camp and was able to get a leave of absence on the stipulation that I would return within 30 days to be discharged and I was instructed to bring at least two pay stubs for verification of employment. I lived with my Mother for a while then she left and went to Vermont to live. At the age of eighteen I was again on my own, ready to start a new life in Hartford Connecticut. After a year of courting Florence Beaulieu, I married her. We were married in West Field, Massachusetts at the Saint Mary’s Catholic Church. This picture was taken at Frank and Eileen Messieurs in Springfield soon after the wedding. Simone and Leo Beaulieu, our best man and bride’s maid had gone home right after the wedding and we were soon to follow, going to our two room apartment on Buckingham Street, Hartford, Connecticut. I hold great respect for all my children. As the saying goes, some times I could have annihilated them. For any one of them. In closing I would like to say that after leaving the C’s I realized how much it had done for me. I was changed person, had more confidence in my self, instilled in me a more honest way of life. The Azure Mountain fire tower restoration project was completed September 2003and a celebration was held on Sept. 27, 2003. The Azure Mountain Friends will continue to conduct a volunteer "fire tower interpreter" program on weekends during the summer and maintain the tower and trail. Here's a picture of the tower, before and after. The photos are from Carolyn Kaczka, co-chair of the Azure Mountain Friends. So she should be credited. Blue Mountain Fire Tower may be best known and most visited fire tower in the Adirondacks. The site was used as a station in the land survey of 1870 and a wooden tower was built there in 1911. 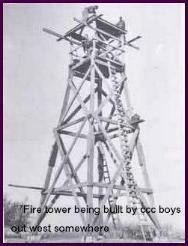 The present 35' Aermotor tower with 7'x7' steel cab was constructed by NYSDEC in 1917 and remained active until 1990. The tower was rehabilitated in 1994 and staffed by volunteers of the Blue Mountain Fire Tower Committee. The CCC restored 3,980 historical structures, and developed over 800 state parks. There were over 4,500 CCC camps and in every state including Hawaii, Alaska, Puerto Rico and the Virgin Islands. 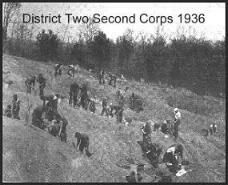 Through the efforts of the CCC soil erosion was ultimately arrested on over 20 million acres. They stocked over one billion fish and spent 4,827,426 man-days surveying and mapping millions of acres and hundreds on lakes. They built 46,854 bridges and 4,622 fish rearing ponds. The CCC installed approximately 5,000 miles of water supply. They improved 3,462 beaches, transplanted 45 million trees and shrubs for landscaping and planted over 3 billion trees where forests were logged and burnt off. They spent 2,094.71 3-man days razing undesirable structures and built 63,256 buildings plus 8,045 wells and pump houses. The CCC spent 6,000,258 man-days in the operation of tree nurseries, they built 7,622 impounding and large diversion dams. They erected 405,037 signs, markers and monuments. They collected 1 3,632,41 5 pounds of hardwood tree seeds and 875,970 bushels of cones. They developed 6,966 miles of wildlife steams and built 28,087 miles of foot and horse trails, and 8,304 foot and horse bridges. They built 32,1 49 wildlife shelters, 1,865 drinking fountains and 204 lodges and museums. 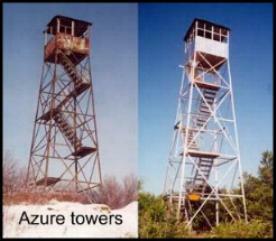 They also built 3,116 lookout towers. The CCC built 27,191 miles of fences and 38,550 vehicle bridges. The CCC spent 202,739 man-days fighting coal fires which had been burning since earliest history. 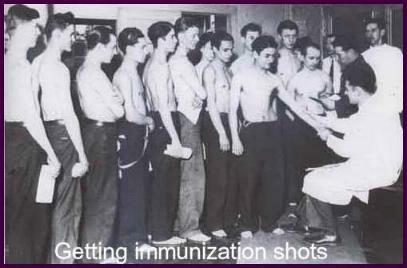 And did you know Hundreds of thousands of the "boys" learned their trade in the CCC. 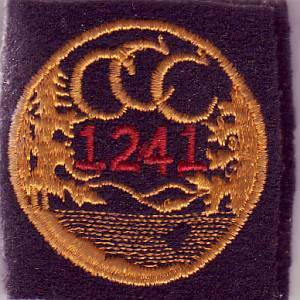 The reason the CCC organization was integrated with the Army Corps Area organization is the fact that the CCC Camps were run by Army personnel. When the CCC's first started, the program was staffed with regular army personnel. The first sergeant, supply sergeant, mess sergeant, first aid man, and the officers were all regular army, navy or marine officers. Once the program got going and cadres trained, the regulars returned to posts and stations and the reserve officers and enrollees ran the whole show themselves. From 1933 until about 1940 the army's main effort was to support the Civilian Conservation Corps.